Now that you’ve had your chuckle, let’s unpack a recent event. This October (2013), the Congressional impasse forced national parks and monuments to close. Palin and Ted Cruz co-opted a veteran’s march at Washington’s World War Two Memorial, which featured tearful old vets in wheelchairs – and men carrying rifles outside the White House. It was entertaining theater, and it quickly faded away. But there are issues of interest here to students of American myth. Samuel J. Redman suggests that the WWII Memorial became a flashpoint in the political rhetoric surrounding the federal shutdown because many see the “Greatest Generation” and its Second World War (the last “good war”) as nostalgic icons. After more than a decade of inconclusive, wasteful military interventions, our successful 1940s crusade serves as a convenient rallying point for conservative political agendas. Had the veterans marched at the nearby Viet Nam Veterans’ Memorial, however, they would have evoked very different emotions. And different myths. Granted, the generation that came of age in 1940 did sacrifice in ways and in numbers that we can barely imagine. They lost much – including the 500,000 soldiers who were sent home because of psychological trauma. The ironically titled 1946 film The Best Years of Our Lives sensitively depicts some of the problems the vets encountered as they attempted to re-integrate themselves into the “normal” lives of those who hadn’t experienced combat. I say “ironically” because the film never states clearly which years those were. As some vets will admit, those best years may well have been their years of service, when they faced the terror of the war shoulder-to-shoulder and life for many was reduced to the question of survival. And they were very well compensated. For most of the vets, the best years were a time of extraordinary governmental generosity (financed by equally extraordinary taxes on the wealthy). America experienced the immediate post-war years with a confusing mix of celebration and dread over both the economy and the new other – communism. But the condition of most of the vets soon righted itself when the G.I. Bill became operational. It provided a broad range of benefits, including low-cost mortgages, low-interest business loans, cheap university educations and unemployment compensation. It was available to every honorably discharged veteran who had been on active duty for at least ninety days; combat was not required. By 1956, roughly 2.2 million vets had used their benefits to attend college, and an additional 6.6 million had received work training. The bill also financed ninety percent of the 13 million houses constructed in the 1950s (however, Southern senators made sure that ninety-eight percent of those homes went to white veterans). See Over Here: How the G.I. Bill Transformed the American Dream, by Edward Humes. And there is a deeper story. The myth of the killing of the children – the literalization of initiation ritual into actual child sacrifice – is the narrative that underlies all of western culture. We are all exposed to and/or identify with Jehovah, the god who demands child sacrifice, or that other god who eats his children. Kronos in his American incarnation presides over an ironic mythic space that emphasizes youthfulness in all things, while offering no future to the young. Again: the veterans sacrificed so much. They were proud to scrimp and save so that their children might have the educational and material advantages they had never had themselves (at least until the G.I. Bill). Yet, when the baby boomers eventually articulated their rebellion, they commonly lamented the commercialized, violent, polluted, banal world of their parents. The vets had also sacrificed their imagination. Many commentators insisted that the source of the “generation gap” was the Oedipus complex (indeed, I can easily imagine them flinging the same criticism at this essay). Certainly there was rage against authority. But if young people dreamed of patricide in the 1960s, it was directed against Kronos’ insatiable appetite for his own children, and it was driven by a sense of betrayal. After all, hadn’t oracles warned Ouranos, Kronos and even Zeus that their children would overthrow them? Isn’t that fear at the root of the patriarch’s reign of terror? Two myths intersected in the 1960s. The universal dream of the hero’s journey collided with a nightmare, the refusal to anoint the new kings and queens of the world. Youths demanded initiation and meaning, while elders stiffened and offered the false choice of either stultifying conformity or literal sacrifice in Southeast Asia. The phrase, “Don’t trust anyone over the age of thirty!” revealed a profound grief about the loss of something all children enter this world expecting: a ritual community of wise elders. Adults could not initiate youth into a meaningful world, because that world had disappeared and because they had never been initiated themselves, except into war and the culture of consumerism. The generation that had survived the Great Depression, saved Europe from the Nazis and overwhelmingly voted Democratic could only respond with, “My country – right or wrong!” The youth, however, who saw the mythic issues clearly, responded: “Hey, hey, LBJ! How many kids did you kill today?” After several years of this inter-generational conflict, polls revealed that “Middle America” approved of the 1970 Kent State massacre. And they were willing to support reactionary politicians who would never serve their interests. Here is a profound mystery: The G.I. Bill was the most generous welfare program in world history. Yet, since the Ronald Reagan years, its primary beneficiaries have consistently supported policies that deny similar benefits to their own children and grandchildren. Below the concern for family values, the actual political choices that older, white Americans have made apparently indicate something very different, that they despise the young, because the young question all the values they have lived by. 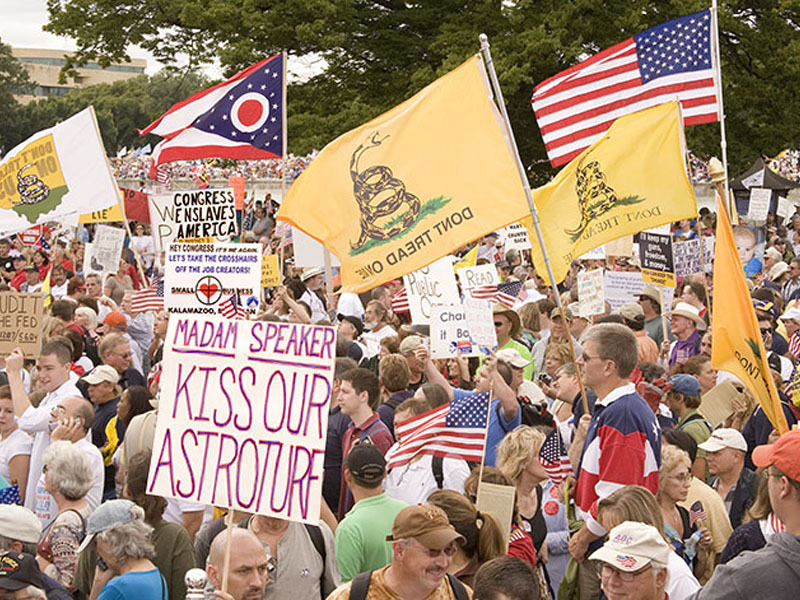 Here is another mystery: Images of Tea Party rallies, Trump supporters and white supremacists reveal that among the old people are quite a few young people. To me, they embody two mythic themes. The first is the American identity in terms of the racialized Other. Practically everyone in these photos is white. The rallies are classic examples of white privilege. Just imagine how the Secret Service would have responded if those gun-toting, President-insulting rowdies had been black. The second theme returns us to Kronos and the patriarchs. We re-create our myths by passing them on to each new generation, who ritually re-enact them. I normally don’t try to analyze other people, but the concept of “identification with the aggressor” seems appropriate in this case. As Anna Freud observed, if a child introjects both rebuke and punishment and then regularly projects this same punishment on others, “then he is arrested at an intermediate stage in the development of the superego.” The literature of the Holocaust speaks of death camp inmates who were so traumatized that they willingly and brutally served their Nazi captors. In mythic terms, Kronos, the uninitiated, child-consuming father, is reborn yet again. Angry, old white men (and those who, regardless of age or gender, identify with them) have been taught to feel victimized by the poor, the non-white, the female and the gay. They constitute the bulk of the Tea Party. Ironically, they seem to prefer public spaces that memorialize their own idealized youth – and their innocence. …an essentially totalitarian form of art or architecture…a big rock telling people what to think…pretends to have a meaning…that never changes over time, never evolves — it fixes history, it embalms or somehow stultifies it. A monument to the spirit, sacrifice, and commitment of the American people to the common cause of defense . . . and to the broader causes of peace and freedom from tyranny . . . an important symbol of American national unity, a timeless reminder of the moral strength and awesome power that can flow when a free people are at once united and bonded together in a common and just cause. Indeed, this pleasant, park-like environment is as boring as a waiting line at the post office. Planning it twenty years after the Viet Nam Memorial, its designers knew perfectly well how emotionally compelling it could have been. We must conclude that they chose intentionally to tone down its impact. The Viet Nam Memorial has spawned the designs of 150 other memorials. However, writes Elizabeth Hess, “A strong desire to diminish, rather than engage (its) radical elements…is evident in the majority of these new memorials.” The designers of the World War II Memorial created a fine, sunny place to take an aged veteran, a safe place calculated not to bring up too many unpleasant memories and to sooth them should they appear. It casts few shadows. The two memorials evoke two aspects of the National Mall and our national soul. The Washington Monument is the grand center of the mall, standing halfway between the Capitol and the Lincoln Memorial. Along the Mall, several great museums stand between it and the Capitol, while between it and Lincoln’s shrine we find war memorials. With the exception of the Holocaust Museum and the Museum of the Native Americans, the eastern half of the Mall displays America’s great achievements, whereas the western half (the direction of death in indigenous myths) grudgingly accepts the need for darker meditations. Native American spirituality, however, teaches us to honor all four directions and their corresponding elements. The Washington Monument rises into air, visible for miles, whereas the black-stone Viet Nam Memorial descends into earth. 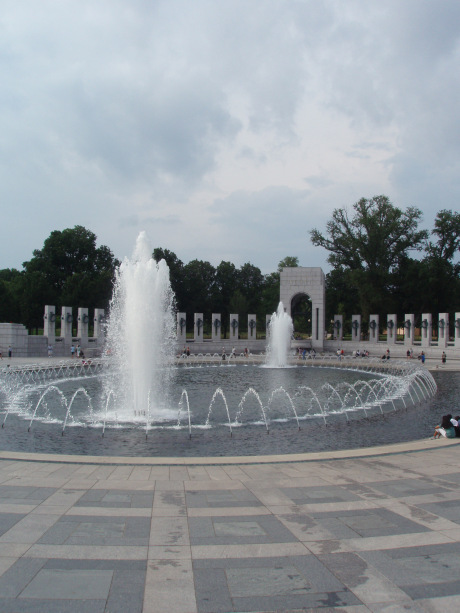 The World War II Memorial receives a pleasant flow of water from the reflecting pool. Like the Washington Monument, its primary color is white. Perhaps it is so uninspiring because it lacks any reference to the fourth element, fire. It lists almost all of America’s great victories – but not Dresden, Tokyo, Hiroshima or Nagasaki. Without the balance of fire, the soothing balm of water becomes a white-wash of memory (the goddess Mnemosyne, in Greek myth). The Washington Monument belongs to Kronos and the father gods. This fifty-story-tall phallus speaks of potency, confidence, progress, growth and achievement. In 1885, it was the tallest building in the world. Like the huge painting in the Capitol Rotunda (The Apotheosis of George Washington), it proclaims his—and America’s— right to sit at the table of the gods. It reaches to the heavens that, in our myth, have blessed America with its unique destiny and responsibility to improve the world. Its whiteness symbolizes purity, righteousness, redemption—and, let’s admit it, the dominance of white people in a city and a world that is overwhelmingly non-white. It represents the American empire and the capacity to serve its ends, even if those ends require the periodic sacrifice of its children. By contrast, the Viet Nam Memorial is for the sons and the grieving mothers. So much is obvious. If we take a deeper look, however, we see something else, something that could not have been consciously designed. Some greater power, unconcerned with chronological time—Mnemosyne herself, perhaps—has been at work. The Viet Nam Memorial is aligned so that one wall points directly at the Washington Monument and the other aligns with Lincoln. Or: that they stare directly at it. 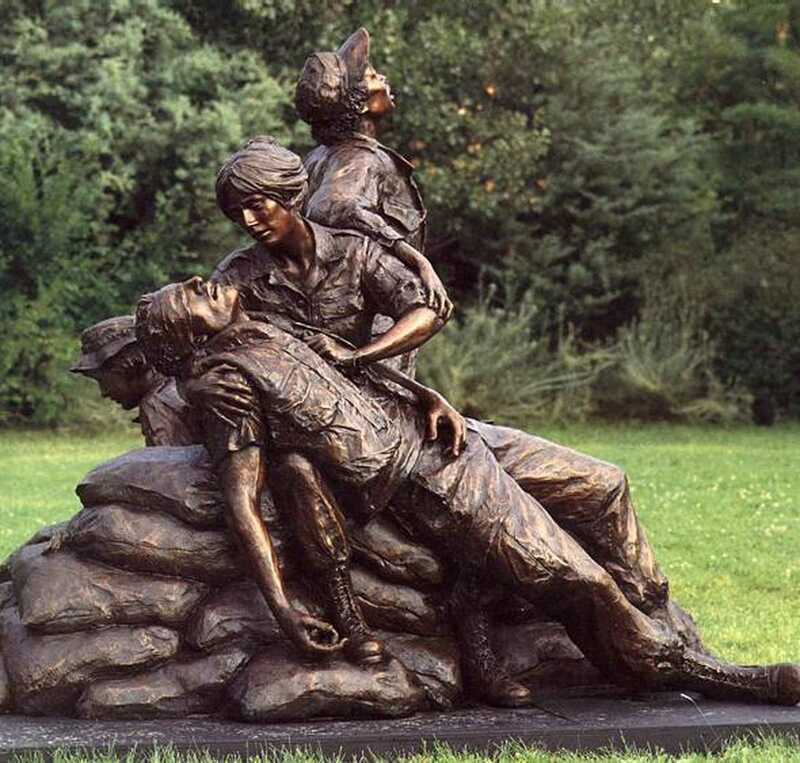 After its comple tion two sculptures were added nearby: Three soldiers gape at their own future, while three grieving nurses—one of them holding a dying soldier in a Pieta pose—can’t bear the sight and turn away. 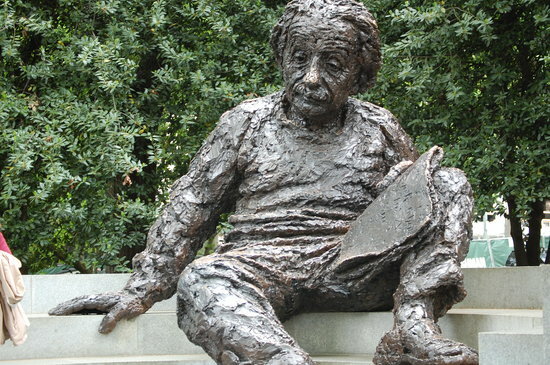 Tourists who cross Constitution Avenue from the Lincoln and Viet Nam Memorials sometimes stumble upon the lesser-known Albert Einstein Memorial Grove, and here is where we may intuit deeper significance. Einstein holds an open book inscribed with his equations that unlocked the secrets of the universe. But his eyes – the saddest I’ve ever seen in stone – seem to be acknowledging that every increase in knowledge is an increase in suffering. And this sculpture, three years older than the Viet Nam Memorial, is staring directly at it, as if to imply that Einstein’s discoveries led to Hiroshima, the Cold War, three million dead in Southeast Asia, 9-11 and the betrayal of thousands more sons and daughters in Iraq and Afghanistan. While the Washington Monument boasts of our brightness and the Lincoln Memorial of our ethics (“With malice toward none . . .”), the Viet Nam Veterans’ Memorial, this bloody gash in Mother Earth, offers us the opportunity to drop the mask of our innocence and, like Persephone dragged down by Hades, find our souls in the center of America’s darkness. The greatest lights cast the largest shadows. The Memorial insists on reminding us of those shadows—and that our healing can come only from directly facing our losses and crimes. But the Washington Monument, like all cathedrals to the father gods, pulls the eye away from the ground, away from any emotions but awe or pride – away, like Alzheimer’s disease, from Memory herself. Like her father Ouranos, it pushes its children down into the Earth, where the three mother goddesses await half a mile away. The World War Two Memorial, situated almost halfway between the Washington and Viet Nam sites, seems to be torn between grief and pride, between memory and forgetting. Like the myth of American innocence itself, it tells a proud story without a shadow, mixing manifest destiny with the denial of death. It resolves this contradiction by declining into banality. Did the old vets who were so upset at its temporary closure consider whether their support of reactionary demagogues ensures that America will eat more of its children? Closure? Is this why they – and we – cannot get closure with our own past?